The Dean's List and Student Award Ceremony is a time for the Eugene Lang College community to gather to celebrate the hard work of our students. We recognize high achieving, academically rigorous students as well as their unique and groundbreaking work. From Civic Engagement and Social Justice Mini-Grant recipients to Eugene Lang Opportunity Awardees and Lang Global Ambassadors, as well as our amazing Dean's List Students, just to name a few. 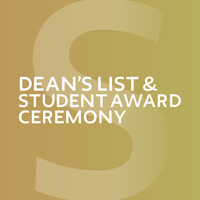 We warmly invite you to join us for the Dean’s Honor Symposium and Dean’s List and Student Award Ceremony. Open to all Lang students, faculty, family, and friends.